Apartment in a 17th century building with a panoramic terrace in the heart of the Old Rome, in the green Gianicolo, between San Pietro and the Colosseum, not far from the shopping streets. At the heart of the nightlife, surrounded by trendy bars and restaurants, first floor (70 sqm) without elevator: large bedroom with king-size bed, open-plan lounge with double sofa bed and dining area, equipped kitchen, bathroom with tub / shower and private terrace upstairs (30 sqm) with sun loungers, table and umbrella. Furniture and new appliances: Smart TV, digital terrestrial channels and streaming, Wi-fi, telephone, air conditioning, washing machine, dishwasher, central heating, double glazed windows and mosquito nets, bed linen and towels provided with change available. Checkin from 2pm, checkout until 11am. The apartment may not be suitable for children under 10 years. My wife and I stayed in the Garibaldi Roof Garden at the end of February. It was just as advertised and as shown in the photos. The flat is one flight up from the street and very secure. The bedroom is on the street-side and as the windows are insulated the noise from passing traffic is manageable. The room is large with high ceilings and with room to stow your things. The living room is comfortable with a sectional sofa that (apparently) opens to a bed. A large screen television with access to Italian cable and Netflix, etc. Not that you will want to watch while in Trastevere. The kitchen is small but furnished with all that you need. Camilla and Alessandra provided us with yougurt, water, soda and other things. A very nice touch. The bathroom is light and airy. Lots of hot water with good pressure. And, of course, there is the private terrace on the roof. It is a walk up two flights of stairs and is a very nice spot. Unfortunately for us the weather was quite cool and were were not able to enjoy it as we would have hoped but I can see how it would be a great place to live during the warmer months. Camilla and Alessandra could not have been more accommodating and responsive. They were always a quick text away. They also had great restaurant recommendations. Well done! Finally, this was my first time staying in Trastevere. The flat was a short walk from everything and just across the river from the entire historic district. I highly recommend the Garibaldi Roof Garden. Oh, we had such a wonderful time. The apartment was perfect. Very nice and clean, well stocked and a perfect location. Camilla and her mom were wonderful hosts. We were greeted with supplies to get us going and given help on a moment’s notice if we had questions about getting around. It couldn’t have been better. The Trastevere section of Rome is perfect and you can walk everywhere. Loads of great restaurants and shops and you can pack light because there is a great laundry a short walk away and they wash and dry your clothes in a couple of hours. And a beautiful roof garden. What a wonderful host and a wonderful apartment. With any luck, we’ll be back. Thank you Camilla! This was one of the most comprehensively stocked properties I’ve ever stayed in. A beer in the fridge, breakfast treats, a selection of coffee makers, beautifully stocked kitchen - everything you could need. Prime location, gorgeous rooftop, professional organisation, family warmth. I wish I could’ve stayed longer. Hosts were wonderful, very helpful with our stay. Prompt in addressing any questions or concerns. The apartment was very well appointed with frig items, snacks, maps, guide books and so on. Everything worked, instructions for use of all appliances etc were in English and easy to understand. Terrace was a pleasant addition. A very nice place to stay. Wonderful hosts with the perfect home away from home! Located in the heart of a fantastic neighborhood with delicious dinner, gelato and drink options. Very local feel and within walking ditmstance of the river and major tourist attractions! My wife and I were quite sad to be leaving after two weeks in this wonderful apartment. It was, without doubt, just as advertised - in fact, it exceeded our expectations, because Camilla and Alessandra provided so many little extras in the way of food and drink supplies and bathroom provisions. We can recommend this property without hesitation. 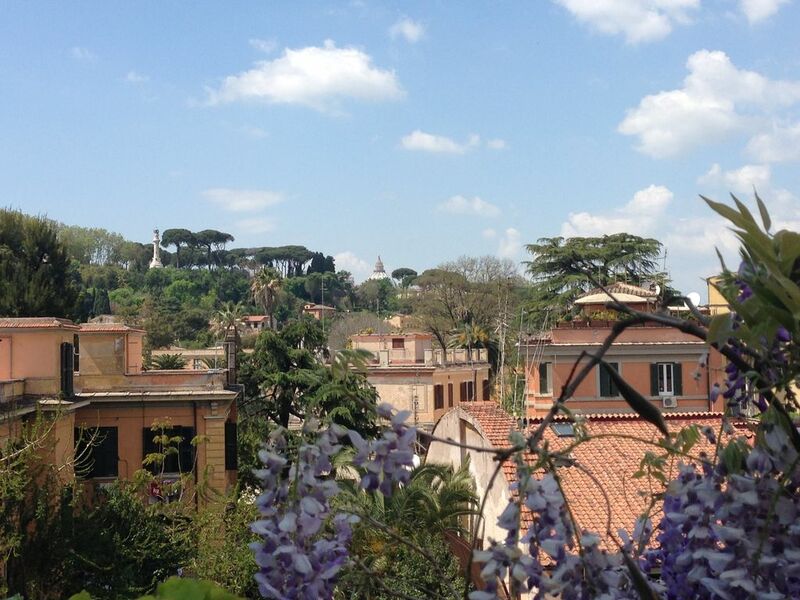 It is perfectly located for anyone willing to walk to any of the major tourist attractions in Rome. It's a short walk to any of three or four bridges across the river. There are dozens of pizzerias and restaurants in the immediate neighbourhood and we ate at a different location each night. The exception was Da Fabrizio, which is a lovely restaurant, not as noisy or frantically busy as most, only a few doors away from the apartment, which serves excellent Roman cuisine in a friendly manner - we dined there twice because it was so good. In short, if you are thinking of renting Garibaldi Roof Garden, don't hesitate. We recommend it highly. Trastevere is one of the most characteristic neighborhoods of Rome, right in the center, beyond the Tiber. Take a stroll through its narrow streets is a journey into the past: the day seems to be in a medieval village with its craft shops, stores, markets, and many people who stop to chat in the street; the evening the area is transformed and becomes a favorite spot to spend the evening, thanks to the local Roman nightlife, cafes and restaurants, pubs stay open until late. It is the Old Rome: narrow streets, small and old houses, churches and monuments, romantic squares, where you can breathe the authentic soul of the Romans. Then climbing on the Janiculum hill from the terrace you can enjoy a spectacular view and watch the ceremony of the stroke of midday cannon. Tassa di soggiorno non compresa nel prezzo, da pagare all'arrivo, in contanti o carta di credito, di 3,50 euro / persona / notte fino ad un massimo di 10 notti, per gli ospiti maggiori di 10 anni. All'arrivo ho bisogno della copia di Vs documento da trasmettere alla Polizia di Stato.